Ladies and gentlemen, are you hyped for Breaking Benjamin!? The post-grungers are back on the road again in 2019 – if you missed them last year, now’s your chance!! With special support from Chevelle and Three Days Grace, they’re headed to Jiffy Lube Live, Bristow, on Thursday 22nd August 2019!! Don’t miss it – click the “Buy Tickets,” button now and get yours quickly, before they go! After a phenomenally successful tour in 2018 with their latest album “Ember,” Breaking Benjamin are on tour once more, responding to fans demand for more live renditions of their critically acclaimed record, as well as, of course, all the big hits from across their several-decade long career. 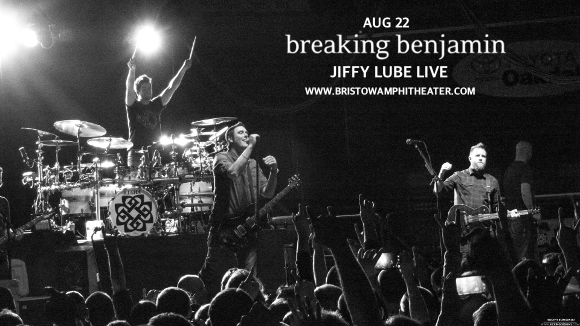 Are you ready to experience the latest, most cohesive form of Breaking Benjamin ever LIVE in concert?? Then get those tickets while you can – they won’t last long! !